On January 16, Lithuanian Minister of National Defence Juozas Olekas and Defence Minister of Hungary Dr. Csaba Hende met at the Ministry of National Defence and addressed security and defence matters of relevance to Hungary and Lithuania, Ministry of National Defence said. According to Minister Olekas, Hungary and Lithuania share their history, similar experience from the contributions to NATO's operations, initiatives and projects and shared views regarding the majority of security and defence points, informs LETA/ELTA. "We have welcomed the news about Hungary's resolve to join the Baltic Air Policing mission from the cycle of 2015 with our greatest delight. The mission is one of the clearest examples of the solidarity among the allies, therefore it is a great pleasure to see more member states expressing their will to deploy on the mission," Minister Olekas said. Minister C. Hende highlighted that Hungary's decision to become a contributing nation to the Baltic Air Policing mission is very important for his country too as it is going to be an unprecedented experience in the history of the Hungarian Armed Forces. The Defence Minister of Hungary also expressed gratitude on his country's behalf to the Baltic States for the increased Host Nation Support they render to air contingents conducting the Baltic Air Policing mission. The meeting Ministers also discussed cooperation of their respective countries in organising NATO exercises. "We are absolutely grateful to Hungary for the weighty support in organising NATO's exercise Steadfast Jazz which will be conducted according to an Article 5-based scenario in the Baltic countries and Poland next fall." According to Olekas, large-scale exercises held on a regular basis, occasionally in the Baltic Region as well, are essential for sustaining the interoperability of the allies and their readiness to respond to contingencies. Minister C. Hende asserted that training for and contributing to NATO's Article 5 (collective defence) operations was a crucial element in the experience of the Alliance's forces too. When addressing collective participation of Lithuanian and Hungarian forces in joint operations, Minister Olekas assured that Afghanistan will remain an important point on the agenda of each ally. "My counterpart and I have shared the experience from and future plans of participation in the operation in Afghanistan," Olekas said. 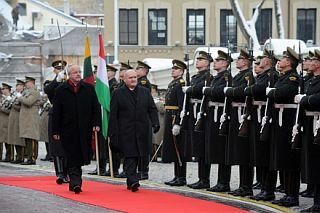 The Defence Minister of Hungary highlighted that Lithuania and Hungary had shared views and similar experience from the operation in Afghanistan. The Minister of National Defence also presented Lithuania's achievements and plans regarding the development of NATO's Energy Security Centre of Excellence. In his turn, the Hungarian Defence Minister underlined the importance and benefit of the Centre and said that Hungary was planning to join the programmes implemented by the institution in the future. In the meeting the Lithuanian and Hungarian Defence Ministers reviewed the key priorities of Lithuania's Presidency of the European Council in the second semester of 2013 – the Eastern Partnership and energy security. The Minister of Hungary emphasised that Lithuania's priorities were absolutely matching with Hungary's interests, particularly when it came to the inclusion of Moldova, a strategic partner of Hungary, into the European agenda. Minister C. Hende affirmed that energy security was a priority point on Hungary's security agenda as well.